Re: What 4K TV Do You Recommend? The LCD of my LG 43UH6500 recently got horizontal lines. Buti na lang pasok pa sa warranty at naitago ko yung receipt. Bought it from SM Appliance Store. I scheduled a home service from LG thru their website. They checked unit and determined that the LCD was defective. My TV is more than a year old. Bought it last October 30, 2016. Within a week they replaced the LCD panel. So now it's like new again. Very satisfied with LG's customer service. My next TV would probably be LG too. It also helps that the TV has official warranty. That's why I wouldn't buy from those "cheaper than mall prices" sellers where you don't get any official receipts. Then get left out in the cold when the unit breaks down. Here's the receipt that they sent me. I paid nothing. 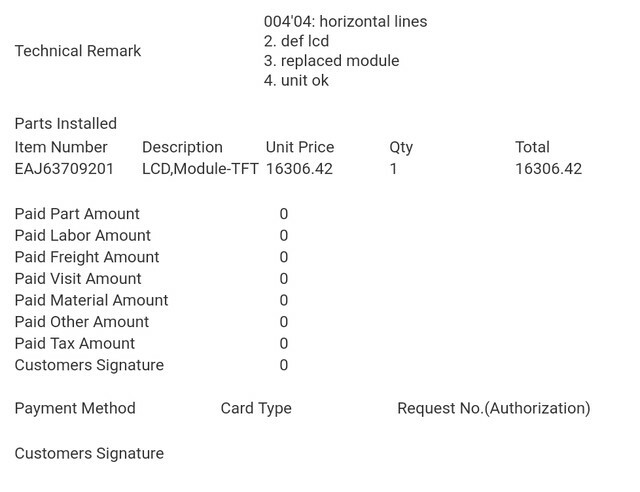 And the LCD replacement was worth 16k. ^^ Thanks for sharing. That's a good advice. Eto pala yung thread. Nagtanong ako dun sa gaming discussions hehehe....anyway, copy and paste ko ma lang. I read somewhere na 2 HDMI ports lang ang 4k capable sa Sony 49X80E. Is this true? I tried all 4 HDMI ports and lumalabas naman sa HUD na 4k yung resolution (3840x2160p) on all of them. Wala akong idea dito. Wala ring nakalagay sa specs. Pero kung HDMI 2 na yung port, capable na raw ng 4K. Hindi kaya kapag HDMI 1.3 lang. Natutunan ko lang dun sa nagkabit ng cable box namin. If 4k panel yan, lahat ng HDMI 4k capable. Nagkakaiba lang ata if 4k hdr capable yung hdmi slot. Sa sony x800d ko 2 lang yung 4k hdr capable na hdmi slots (HMDI 2 and 3). ^^Yep. Ganyan din ata yung Sony X80E based sa mga nababasa ko online. Yung 2 and 3 lang. Is there a way to boost the resolution from 3840 X 2160 to 4096 X 2160? Based sa manual parang pwede but I can't seem to make it work. Wala pa ako bagong HDTV, pero lumitaw ang video na ito sa recommended sa akin ng YouTube.